Brochure Design Are you ready for a Wildfire? Do you know how to properly prepare…evacuate… or shelter in place, in the event of a wildfire, flood, mudslide or other disaster? While a lot of literature and on-line information is available from different sources, most are generic and will not apply to your unique area. This is why every community should have collateral, designed, specific for their locale. This material must be comprehensive and include information like evacuation routes, local shelters and reference contacts to local services. In the foothill communities of Orange County California, devastating wildfires followed by mud slides have racked our canyon community. Homeowners were unaware how to protect their property. In response, our local Fire Safe Council commissioned a brochure to been developed. Fire Prevention in the Canyons, a 12-page brochure was produced which included property clearance along with local fire prone and fire-resistant vegetation references. The community related to the information as the photos, text, and examples are specific to our local area. This collateral is distributed at all local events and available on-line at the Fire Safe Council East Orange County Canyons website and has proved to be an effective measure in fire prevention. Residents expressed concerns on what to do if there is an approaching wildfire. 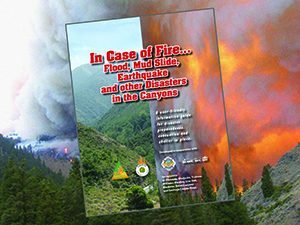 This was addressed in a companion piece, a 12-page brochure titled: In Case of Fire…Flood, Mud Slide, Earthquake and other Disasters in the Canyons. The collateral provides in-depth information relative to our canyon community including local GMRS radio instructions, an evacuation map showing closure check points, and website links to local emergency services. Guidelines from Preparation, to Evacuation, to Shelter in Place are included along with, what to do when the disaster is over. Wildfire Evacuation, Wildfire prevention, Wildfires. Bookmark.